During the winter snow and cold, it helps to give protection to some kinds of woody plants. This guide is about preventing damage to trees and shrubs in winter. I bought a miniature rose bush this year and want to protect it from wind and snow. 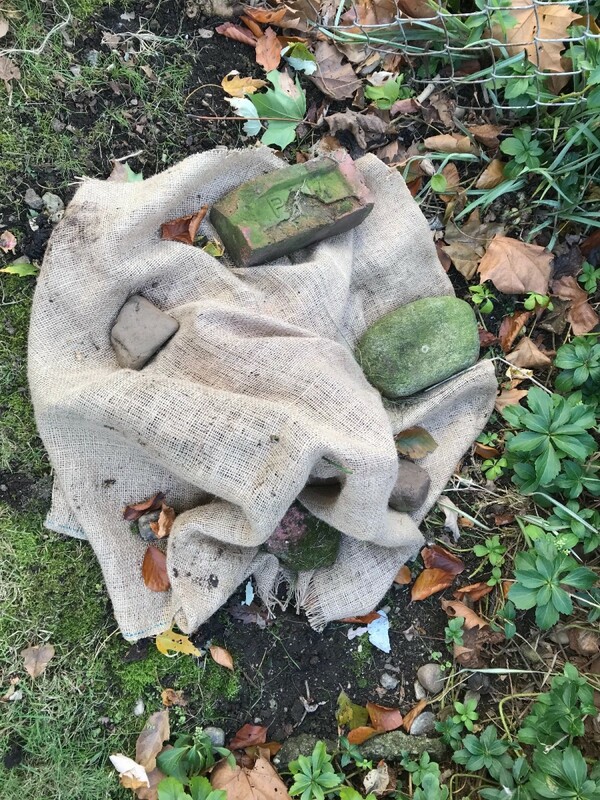 I put some burlap over it and put some rocks and bricks down to anchor it. A tree's bark acts as a protective barrier in the same way skin protects the human body. It protects the tree's underlying vascular system from insect and animal damage and acts as a buffer to external changes in environmental conditions. Winter can be tough on trees, especially young trees and species with thinner bark. Over time, splits in the bark caused by sunscald can weaken your trees, adversely affecting their development and leaving them more vulnerable to attacks from animals, insects and disease. 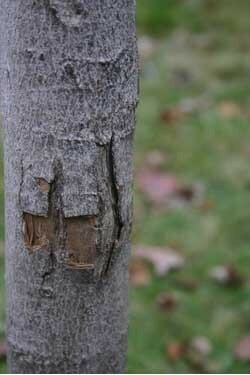 When properly applied, tree wraps may reduce the incidence of this common winter injury. Here is a look at some different types of tree wraps and how use them appropriately. Just about everyone living in a winter climate can appreciate a warm and sunny winter day-everyone except your trees, that is. Sunscald, also referred to as "southwest injury," is a common injury on young, thin-barked shade and fruit trees in lower zones. Even on the coldest winter days, due to its lower angle in the sky, the heat of the sun can cause the inner and outer layers of bark on the tree to warm up. This happens most often to the bark on the south or southwest side of the tree, or when trees are planted near asphalt, brick or concrete buildings or next to other types of heat absorbing materials. Later in the day, when the sun sets and the temperatures fall, ice crystals form in the bark's cell tissues. Because water expands when it freezes, the cells may burst and die, causing the bark to split open. Although the damage can happen anytime between November and April, the splits may not be visible until the summer months. 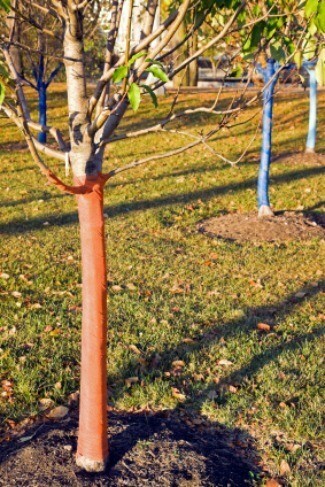 There are dozens of types of tree wraps and guards available made from a variety of natural and synthetic materials. All have their advantages and disadvantages. When deciding on what type of wrap to use, consider how well it will protect the bark from external damage (rodents and insects) as well as internal damage (moderating temperature). Plastic Spirals (Guards): These are easy to put on and take off. They also fit loosely enough to allow for air circulation, while discouraging insects and small animals. Guards are not always tall enough to protect the trunk from soil level to the first set of branches. Should be removed in summer months. 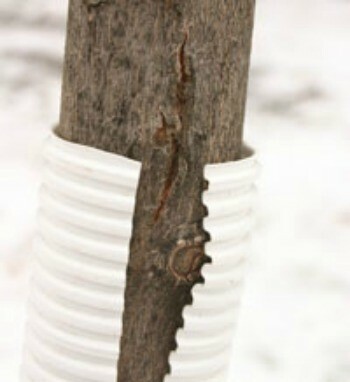 Paper Tape: This is the most common, naturally looking and least expensive option for wrapping trees. Ends can be secured with duct tape or electrical tape. Tape should be removed in the spring and applied again in November. Paper tape may not protect as well against damage from insects or rodents and may not hold up as well to the elements. "New" Skin: These are biodegradable wraps that will expand as your tree grows. It can be left on for two to three years until it decomposes naturally. These wraps are usually more costly, but may be worth a look if you're only wrapping a few trees. Aluminum Tape: This material reflects the sunlight on the outside and offers good insulation and temperature moderation on the inside. As with paper tape, secure the ends of aluminum tape with duct tape or electrical tape. Remove it in the spring and reapply it in the fall. Aluminum tape is slightly more costly than paper tape and its reflective properties look unnatural. Heavy duty aluminum foil is a also a good alternative. White Paint: Professionals who have a lot of trees to cover sometimes use a coat of diluted, white interior latex paint. White paint is highly reflective and interior paint usually contains less harmful chemicals than exterior paint. Paint does have the advantage of easy application and it often lasts for a season or two. The problem is that once it's on, only time can remove it. Many people find that after they apply it, they wish they hadn't. It looks unnatural and it's unclear what the chemical effects are to the tree over time. Wooden Boards: For simple protection against sunscald, use a soft rope or twine to secure upright boards to the south/southwest side of your tree. This will help protect the bark from sunscald, but will not offer any protection against damage by rodents or insects. Apply wraps in early to mid-November and remove promptly in the spring (April). Wraps should start at soil level and end just below the first set of major branches. 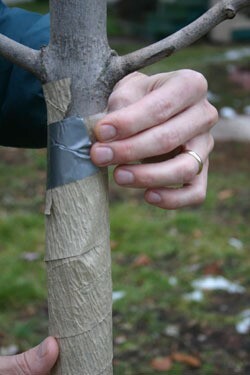 When using tape, start wrapping at soil level and overlap each layer by half a width as your spiral up the tree. Never use nylon cord or wires to secure the ends of the tape. Apply 4 inches of wood chips from the trunk out to the drip line for additional winter protection. Maple, ornamental cherry, dogwood, linden, London plane, elm, horsechestnut, young oak, willow, crabapple, beech, and walnut. If you live in a climate where winters are severe, you've probably already discovered that the snow and cold weather can cause severe damage to trees and shrubs.